intuVision Traffic will give you accurate traffic information effortlessly. Process in real-time or from video files, for a variety of events including vehicle classification and counting, speed, idle vehicles, and more. Our Traffic solution is a complete resource for collection, analysis and reporting of traffic data. intuVision VA Traffic does not require costly installation and provides more information than simple daily vehicle axle counts. intuVision Traffic reliably monitors all vehicle and pedestrian activity. Periodic digests report counts of vehicles by class, average speed, direction and time. All information can be exported as Comma Separated Value (CSV) files for import into third-party applications. Heatmaps provide instant overview of the trends at an intersection. Exportable as high quality images, they are perfect for understanding overall traffic flow. intuVision VA Traffic enables seeing well beyond the data, with an intuitive glance at hidden traffic patterns. License purchase is not tied to specific camera, so you can move processing from one camera to another. Detect multiple events from one camera view, we allow you to add unlimited event types per camera. Reliably classify between cars, trucks, motorcycles, and more. Generate counts or speed information for each group. Day vs. night settings allow you to apply different settings at night for reliable tracking. Headlight removal allows for accurate nighttime counts. Detect traffic stopped with idle object detection. Treat different events as desired, send an alarm for stropped traffic, but generate counts for traffic counts, etc. Hourly, daily, or weekly email digests send traffic counts directly to your email. CSV export of event counts lets you ingest information into other applications. Heatmaps allow overview of traffic information and provide intuitive demonstration tools for presentations. Search vehicle or person tracks for post event analysis. Without needing to reprocess video, you can search by classification type, color, location, time, and more. Compound events, either between cameras or on the same camera - create more advanced events to perfectly match every project. Contact intuVision directly to purchase our analytics solutions. To find a reseller in your region, contact us at info@intuvisiontech.com. Integrators and resellers contact us at sales@intuvisiontech.com. intuVision VA offers the unique capability to add as many events and event rules to each of your cameras - meaning that with the same camera you can classify vehicles and detect speed, turn counts, and idle objects, while still managing pedestrians. As with the other modules, intuVision Traffic events also include those in the intuVision Core module. Activity Detect any moving object activity in a zone, can be limited to people or vehicular activity. Average Speed Measure the average speed of vehicles directly from traffic video and summarize by vehicle type. Camera Tampering Detect when a camera has been obscured or blocked, either unintentionally or maliciously. Color Search Perform a color based search of people or vehicles, to quickly find suspicious objects after an event has occurred. Congestion Detect traffic congestion and send alerts to notify of potential delays, track traffic congestion over time. Direction Detect vehicles or people moving in a user specified direction. Idle Vehicle Detect a vehicle idling at a location or illegally parked. Intrusion Detect when an object enters into a restricted area. No Exit Detect if a car has parked and no one has left the vehicle. Pedestrian Activity Detect when pedestrians are too close to the roadway or gathering on the side of the road. Pedestrian Crosswalk Safety and Counting Count pedestrians as they walk along sidewalks or crosswalks, ensure pedestrian safety, or detect when people jaywalk, etc. Smoke/Fire Detection Visually detect fire and smoke in camera views. Speeding Detect speeding vehicles or fast moving people. Stopped Vehicle Detect if a vehicle has stopped in a protected area or roadway. Throughput Detect vehicles or people crossing user specified edges of the zone. Turn Count Count vehicles turning in a given direction at an intersection. Vehicle Counting Reliably count vehicles during the day and at night, report counts for all or by vehicle type. Wrong Way Detect vehicles or people going against the flow of traffic. 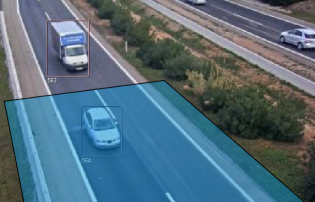 Vehicle Classification and Counting - Use intuVision VA Traffic to count vehicles of different types, with options for real-time processing of video or faster than real-time post-processing of video. Additional events include speed detection, stopped vehicle, pedestrian activity, and much more. intuVision Turn Counts - Track how vehicles behave in a scene and generate traffic heatmaps at the same time. This view was processed with only default settings, which shows how effortless processing with intuVision VA can be. intuVision Vehicle Counting Faster-than-Realtime - An example of intuVision's faster-than-realtime processing due to offloading processing to the GPU. In this view, the system was only looking at the traffic, so pedestrians walking along the sidewalk are not of interest.